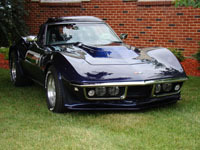 New to the forum and to the Vette world. 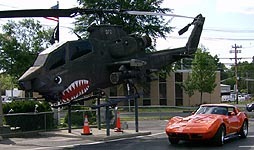 Purchased my Corvette about a month ago. Since then I have been reading up on all of your knowledge to help me with some of the issues I'm finding. You have helped me out already without even knowing it. For that, I say ...Thanks!!!!! Welcome to the forum, I would check the frt diff mount 1st...could be just worn out. Next check all the ujoints including the drive shaft. Last the diff gears which is not common. Could be the rear wheel bearings but they make a bad bearing sound. Hey Alan thanks for your input. I went ahead and just ordered the front mount bushing. What better time to change the front mount bushing while I'm changing the u-joints on the drive shaft. 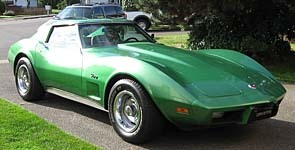 I had the very same problem with my '75 vette when I first got her. I did a lot of hit and misses trying to get it to quit clunking. Finally I found a specialized Corvette Auto Shop near me that I was not even aware of. They changed out my diff. oil and added new, plus an additive. They then took it out in their parking lot and did quite a few "figure eights" and that fixed my problem. 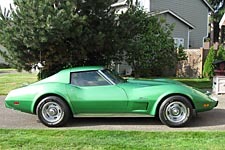 Once in awhile, if the vette sits too long over winter months, come spring, I might get a little noise, but not hardly at all. I just take it out and do the "figure eights" and that removes it right away. you hit the nail on the head. Changed the gear oil and additive in the differential. Did enough figure eights to make me feel that I was on an amusement ride. Driving the 2 mile trip home from work, Nothin. Smooth as can be. Had some serious doubts, but that's what all you corvetterans are for. Still have my list from Alan to finish up. Cant believe how sidetracked one gets under a car. Ended up pulling the spare tire carrier down and cleaned it in the (California approved) parts cleaner No hurry right? Its what we love to do. Anyway, thanks again for everyone's help!!! Hey Jack, thanks for the good news. $$$….. I did pull & push the side yoke while I had the half shaft out. I would say it moved about a quarter inch. So I'm to assume dropping the differential for a rebuild, and will also be needing new side yokes as well? Its easier to deal with something when you know what the problem is. I appreciate the help. Looks like its time to do some research on removing the differential. If it's any consultation when I purchased my 68 16 yrs ago my rear made noises when I turned . So I took off the cover...what fun & looked over the inside ( no metal shavings or nicks on the gears)..everything looked ok so I buttoned it up. Put in posi fluid I think 4 oz but it might have been 8oz then filled it with good gear oil. did the figure eights & haven't had a sound since.